Fishing the U.S. Open King Mackerel Tournament is a family tradition! Forty plus years ago a small group of community leaders met and decided that they needed an event to showcase the great fall fishing Southport-Oak Island area has to offer. The prizes and expenses for the first tournament were guaranteed by those community leaders signing a promissory note at a local financial institution - thus the U.S. Open King Mackerel Tournament was born. You are The Net Man! Tournament Hooks New Logo....For 40 years, the logo for the U.S. Open King Mackerel Tournament has been the same. At the 2018 event, the Southport Oak Island Chamber of Commerce-Welcome Center announced that beginning in 2019, that logo will change to better represent today’s king mackerel angler and the annual event. 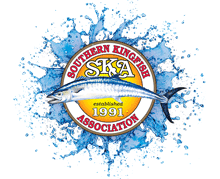 Karen Sphar, Executive Vice President of the chamber, commented about the new logo: “We wanted the king mackerel to have action since it is a fighting fish and it deserves to be the center of attention in our logo”. Could of atleast done something more unique. Jaw is a little off. Kind of looks like a large mouth bass/Venus flytrap combo. But the rest of it is MUCH better than the old. Is it 2019 or 1970. SMH.... With all the technology this is the design. The lower Jaw is off as previously noted...looks like a gator trout to me. Its nice when the year of the event is on the sweatshirts..
Glad to see that yall took input from us anglers on the shirts, I know I had mentioned it a time or 2. Looks good cant wait to see them this year. The lower jaw is “off”. Another sad day for us as we learn Captain Bill Sears of the "Got-Cha" has 'crossed the bar'. Our thoughts and prayers are with his wife Barbara, mother Doris and all the Sears family. Celebrate the life of William Ray Sears, leave a kind word or memory and get funeral service information care of Apex Funeral Home. RIP William fair seas and tight lines my friend.